Don't be afraid of the Trub! 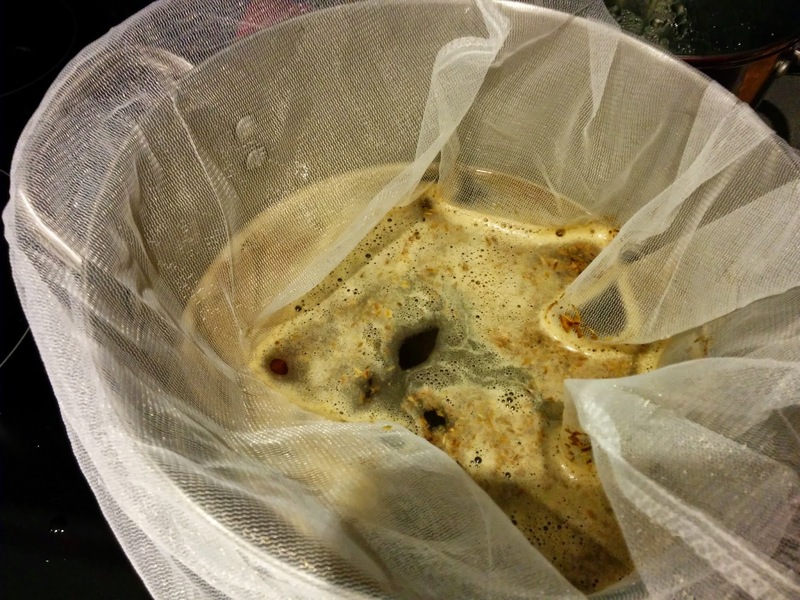 In a lot of home brewing books, and perhaps in the minds of many home brewers, is the advice that you should separate your beer from the trub during fermentation. (Trub, also known as lees, refers to the sediment that appears at the bottom of the fermenter.) The prevailing wisdom is that trub will cause the finished beer to be more cloudy, have "off flavors", and generally turn out worse than a beer moved off the trub into a secondary fermenter. The folks who make the Grainfather did an experiment in February to see if the prevailing wisdom is correct. Would a beer kept on the trub throughout its fermentation taste worse, look more cloudy, have poorer head retention, etc., than a beer removed from the trub? After brewing, half the batch was poured through a sanitized sieve to strain all possible particulate matter out of it. The other half got all the trub when it went into the fermenter. The beers fermented identically, starting with a gravity of 1.044 and ending with 1.005. After 7 days, the fermenters were moved to a refrigerator to cold crash them before bottling. After chilling, another gravity measurement was taken to ensure that gravity had remained the same. It had. A quick taste test showed that the sample from the trub-filled fermenter actually was more bitter than the one from the trub-free fermenter. They got 14 bottles from the trub-filled fermenter and 18 from the trub-free one. So if you want better yields, avoiding trub is a good idea. A blind taste test was then performed of the two beers after bottle conditioning. Tasters were asked to judge the clarity, aroma, head retention, and comment on any off flavors they detected. The results were surprising. The beer brewed with the trub was judged to be clearer by all four tasters. It was also judged to have the better aroma. Tasters were split 50/50 on head retention, but all agreed that it was similar for both beers. But home brewers probably care most about flavor... how did that turn out? All four tasters preferred the beer fermented with the trub. They said its flavors were clearer and more defined than the beer fermented without trub. When asked to guess which beer had been fermented with trub, all four were wrong. The conclusion arrived at by the brewer were that a high proportion of trub can be beneficial. It can improve clarity, aroma, and flavor. The downside to leaving the trub in is that it did reduce their yield by 22%. Perhaps it would be good to reduce trub but not eliminate it when homebrewing. Whether you choose to leave the trub in your beer during fermentation or not, the good news is that you shouldn't have to worry if you can't get it all removed. Your beer may actually benefit from a little trub making it into the fermenter. 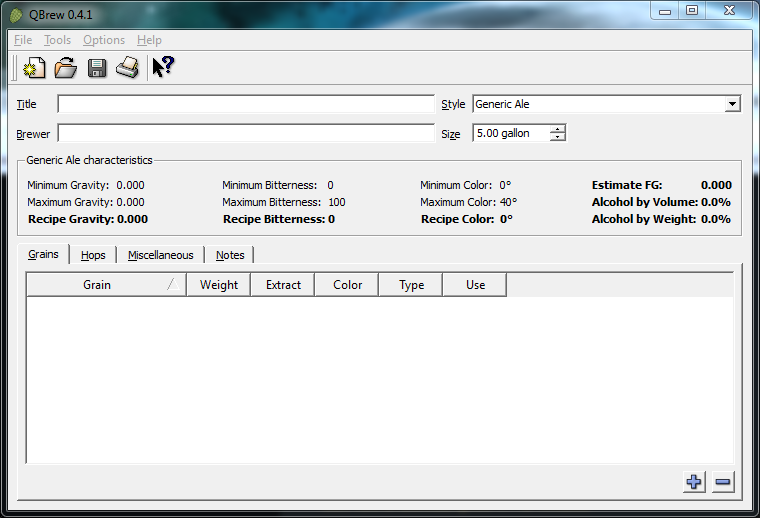 QBrew is a free home brewing recipe storage and calculation program. 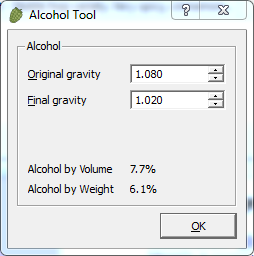 You can use it to create and modify beer recipes, calculate expected gravity, color, and bitterness levels. You can also use it to make corrections for your hydrometer based on the sample temperature and hydrometer calibration temperature. In this post, we'll take a look at QBrew and how it works. For this review, I've supplemented QBrew with the November 12, 2014, version of The Screwy Brewer's QBrew database information. This adds many ingredients to the default database and makes QBrew considerably more useful by eliminating the need to manually enter the properties for various home brewing ingredients. The "Title" field is where you'll enter the name of the beer recipe you're about to enter. The "Brewer" field is where you'll store your own name or brewery name. Loading this information can help you as you tinker with the recipe. You'll be able to tell if, for instance, switching on variety of hops for another will make the beer too bitter (or not bitter enough), if swapping one malt or extract for another will make the beer too dark or too high gravity. 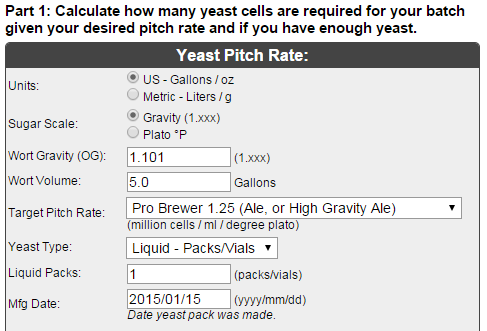 The "Size" field allows you to set the size of the batch you want to brew. 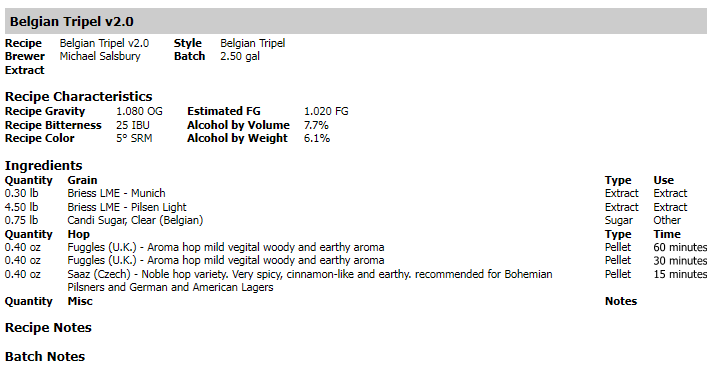 Let's imagine that I want to brew a Belgian Triple, since I've already selected that style. I have an existing recipe that I'm planning to use as a starting point, but let's say that I also want to make some tweaks to that recipe, since I thought it came out too sweet the last time I made it. I'll start by entering that recipe exactly as I last brewed it. 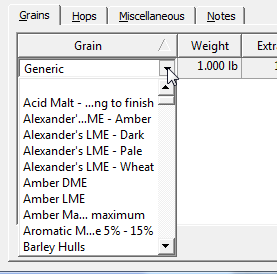 My recipe starts with 1 pound of Munich LME, which QBrew classifies as a grain. I click the grain tab and the "+" button in the lower right. I select "Briess LME - Munich" from the list. I also add in 4.75 pounds of Pilsen LME, 1 pound of Clear Candi Sugar, and 0.2 pounds of D-45 Candi Syrup which is comparable to Amber Candi Sugar. Next, I need to add my hops. I click the Hops tab and the "+" button three times since I use three different hops additions in this beer. That change got my gravity down to where I wanted it. Reducing the grain bill also increased the relative bitterness of the hops, which has taken the recipe from 19 to 21 bitterness units. The printout shows me the ingredient list, boil times for the hops pellets, and the expected gravity, alcohol content, etc. A minor complaint I have is that the tool doesn't pull in the Recipe Gravity from the currently-loaded recipe. However, this is easy to see in the window behind the calculator and easy to enter, so that's a pretty minor complaint. Enter the temperature of your beer sample, the calibration temperature for your hydrometer (found in its documentation), and the reading you're getting from the hydrometer and the tool will calculate a corrected reading. The final tool in QBrew is the Database Editor. This allows you to add ingredients to the database, modify the description or characteristics of items within the database, and remove items you don't ever intend to use. This enables you to tailor QBrew a little to your needs. QBrew also has a number of other configuration options accessible through the Options menu. You can configure the look-and-feel, enable or disable autosave and autobackup, change measurement units from US to Metric, change your Mash efficiency and Steep yield, and set recipe defaults. Again, all this helps you to tailor QBrew's behavior to suit your needs. 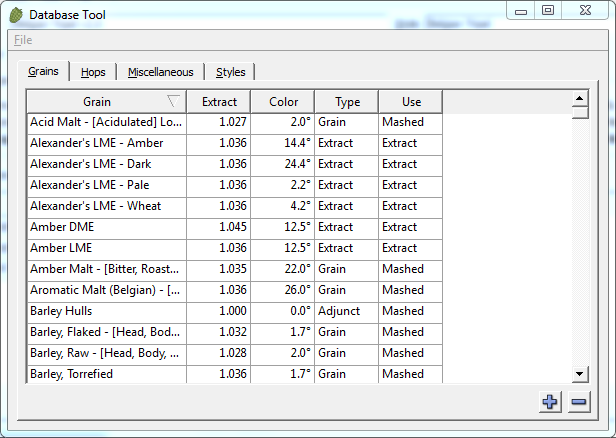 For a free product, QBrew is remarkably powerful and easy to use. You're able to enter and save recipes, adjust them to see how your changes should affect the finished beer, tailor the information to your batch sizes and efficiency levels, etc. 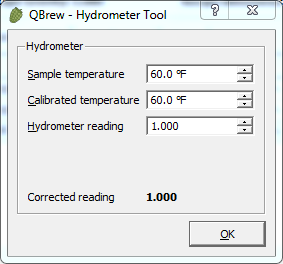 Compared to some of the commercial products on the market, QBrew lacks several features that you might find useful, such as being able to scale the size of the batch (i.e., automatically scale a recipe from 5 gallons to 2.5 gallons), calibrate refractometer readings, store recipes in the cloud, calculate carbonation, and other features. Home brewers with more advanced skills and needs may find QBrew a bit limited, but most beginning and intermediate brewers will find it quite useful for storing and adjusting recipes. As I mentioned on another blog, researchers recently analyzed the contents of a pair of bottles of beer found in a 170-year-old shipwreck. Although the beer had obviously spoiled and picked up sea water during its time on the ocean floor, the researchers were able to identify a number of characteristics about it that might help a home brewer replicate the flavors. They identified two distinct beers, one with an apple flavor to it, the other with a rose flavor. It also reportedly had a smoky flavor from probably being brewed over an open flame. That would put it in the ballpark of a Blonde Ale, which is in the 15-28 IBU range, with a color in the 3-6 SRM range, and relatively low alcohol content. Blonde Ales typically are all-malt beers, but some use wheat malt or sugar. To get that Apple-flavored variant, maybe you'd add some apple juice before bottling. For the rose-flavored one, I might drop rose petals or rose hips in during the last few minutes of the boil. Mash at 154 degrees Fahrenheit for 30 minutes. Sparge the grain. Boil for 60 minutes. Cool and ferment at 67%. I might consider toasting some of the pale malt (not more than a half-pound) to replicate that "brewed over an open fire" element of the flavor... but I'd probably only do that after trying it without. In the case of the rose-flavored beer, I would probably add about two ounces of rose petals (sterilized) into the fermenter near the end of fermentation (and of course remove before bottling). The Hallertau and Saaz in the recipe are described as having floral characteristics and might be a good match. For the apple-flavored one, I might add 2-4 ounces of LD Carlson's Apple Extract. Apple juice or fresh apples would give it a tart, cider-like flavor. If I used fresh apples I might swap a pound of the Pale Malt for another pound of Munich to offset the tartness with some sweetness. When I first started homebrewing, I didn't really worry about labels. I only tended to do one batch of beer at a time, and only got about 8 one-liter bottles per 2.5-gallon batch. That meant labeling the bottles was kind of pointless. That changed in the past year. Last year, I brewed a Belgian Strong Dark Ale, a German Apfelwein, a Belgian Quadrupel, a Belgian Tripel, and at least one other. Earlier this year, I brewed a couple of other beers, and I have things purchased to do at least two more. With all of these batches floating around, I needed some kind of labeling method to identify them all. At first, I went with a Sharpie permanent marker. I'd just write something on the bottle cap to tell me what was inside and called it "good enough". Then, when friends and co-workers started wanting me to bring them bottles of my beer, some wanted labels on them so they could recognize them in the refrigerator. GarageMonk's writable, reusable, dishwasher-safe labels. Post-it notes or something similar, taped to the bottle. Download and install the open source Inkscape software. Create a "box" the size I want my label to be. Create a label that fits in the box I created. Copy and paste the label to fill a page of printer paper. Have Inkscape export the image to a PDF file in full color. Take the PDF file to Kinko's or another shop with a color laser printer. Print the labels and cut them out with scissors or a paper cutter. Use a common children's glue stick to apply glue to the back of the label. Stick the label to the bottle. Using a laser printer gave me labels that would not run if they got wet. Depending on the size of my labels, I might get 12 of them to a page. Copy shops charge only a few cents per color laser printed page, so my labels were relatively inexpensive on a per-bottle basis. The glue sticks cost me $0.33 each at a local office supply store. When finished, they look pretty good. The photo above is the label I created for my Golden Dragon Ale (a Gulden Draak clone). Update 03/05/2017: During the Christmas holiday, I found a really good deal on a Dell color laser printer from Staples. For about $100, I picked up a full-color laser printer and can now do the labels at home on my computer. When you're ready to re-use the bottle, fill a sink or bucket with hot water. Put the bottle in the water, making sure the label is getting soaked. A few minutes later, you lift the bottle out of the water and you can pretty much wipe the label off and re-use the bottle. For some designs you might have to scrape bits of the label off with a fingernail or other object, but it's much, much easier than Avery style labels or pro brewery labels. 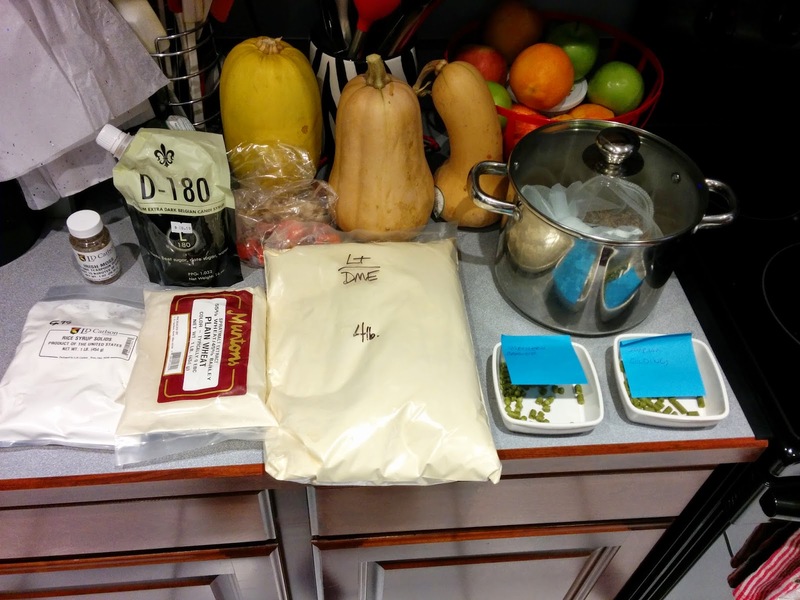 These ingredients were purchased at a local homebrew supply shop and measured in my kitchen on a digital kitchen scale. 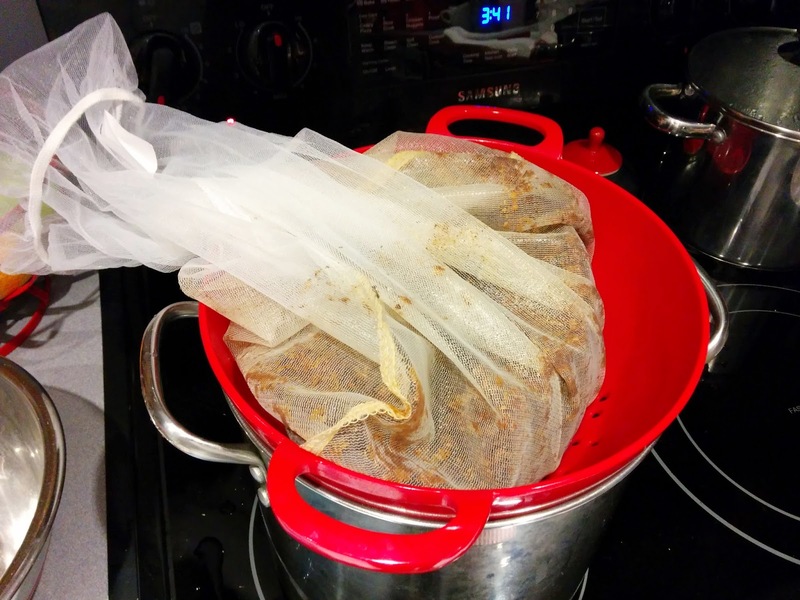 The brewing process began with my filling a 2-gallon kettle with water and heating it to the appropriate steeping temperature for my specialty grains, then dropping the mesh bag containing those grains into the kettle. After the grains had steeped long enough, I had to sparge them with hot water to remove the remaining sugars from them. This left me with a relatively dark but weak wort. I brought this to a boil and dropped a muslin bag filled with hops pellets into it. These were the bittering hops that offset the sweetness of the malt. They are boiled for 60 minutes. During the last 15 minutes of the boil, I added the second dose of hops. 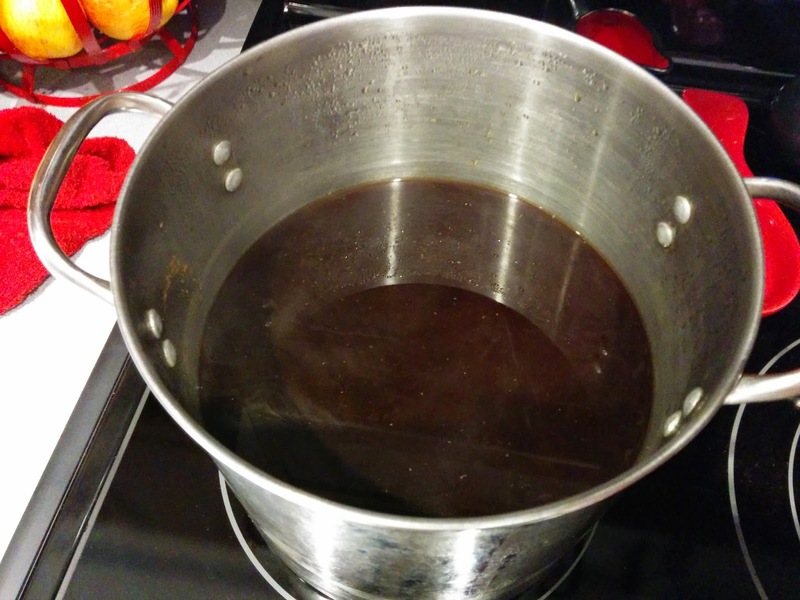 At this time, I also added the malt extract, rice syrup solids, wheat extract, and Irish moss. When the boil finished, I used two methods to cool it down to yeast-pitching temperature (as I did not own a wort chiller at the time). I had previously boiled about 2 gallons of water and placed it in sanitized growlers outdoors in the winter air. This got the temperature down to near-refrigerator levels. I placed the kettle full of wort in an ice bath in the sink and cooled it to around 130 degrees Fahrenheit. 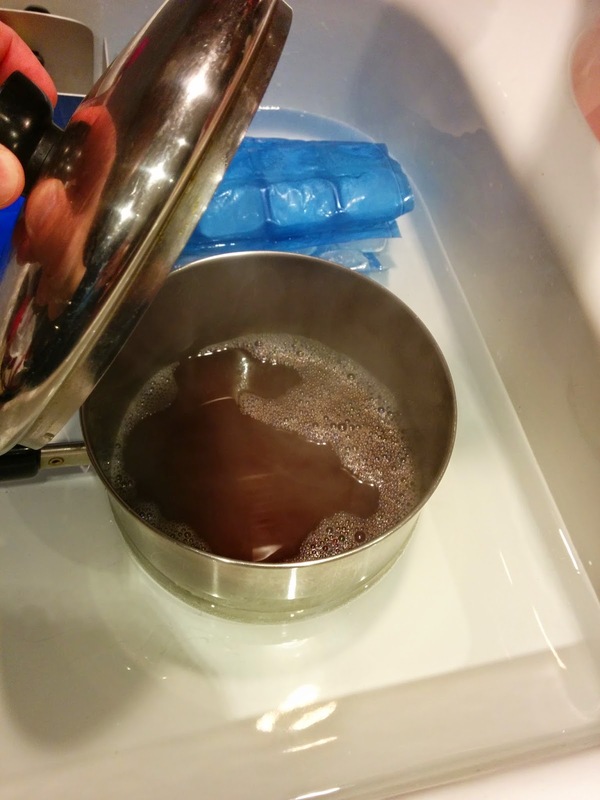 Then I placed a half gallon of the chilled water in my fermenter and added this wort to it. I added more chilled, boiled water until I hit the 2.5 gallon mark in the fermenter. By that point, the wort was at a pitchable temperature. When the wort reached room temperature, I pitched a yeast slurry into it and sealed the fermenter. About three weeks later, my refractometer showed that fermentation had pretty much stopped, so I bottled the beer. I added a carbonation drop to each bottle to give the yeast the necessary sugar to carbonate the bottled beer. This particular recipe also needs to sit in the bottle for 2-3 months after it's finished. It's only been about 40 days since it was bottled. It needs another 20-50 days to reach its optimum flavor. Something I learned after doing this particular batch was that if you're going to dilute the wort as I did in this case, you need to increase the amount of hops you use during the boil in order to achieve your target bitterness level. By introducing the cold water, you are essentially diluting the hops and making a sweeter beer than you intended. This was borne out by the bottle I've had of the "still green" beer, which was sweeter than I wanted it to be. This may mellow out some over the next 20-50 days in the bottle, as the yeast consumes more sugar, but probably not. This explains why some of my smaller batches have been too sweet despite my adding what would have been an appropriate amount of hops for a full-size boil. What is a Yeast Starter? Yeast is the workhorse of the home brewing process. It is the yeast that will take your sugary wort and turn it into beer. In many cases, it is the yeast that will also work in the bottle to carbonate your beer. In many beer styles, like Belgian ales, yeast also contributes flavor to the beer. Given the importance of yeast in home brewing, making sure that you pitch a sufficient quantity of healthy yeast into your wort is vital to ensuring that your finished beer is going to be good. When you purchase yeast for home brewing, you'll typically receive either a packet of dry yeast which must be reconstituted with warm water, a tube filled with yeast in a slurry, or a packet that contains yeast and an activation solution in a "break-open" capsule. If you are brewing a relatively small batch, or a lower-gravity beer, and your package of yeast is within its "best by" date, you may not need a yeast starter at all. 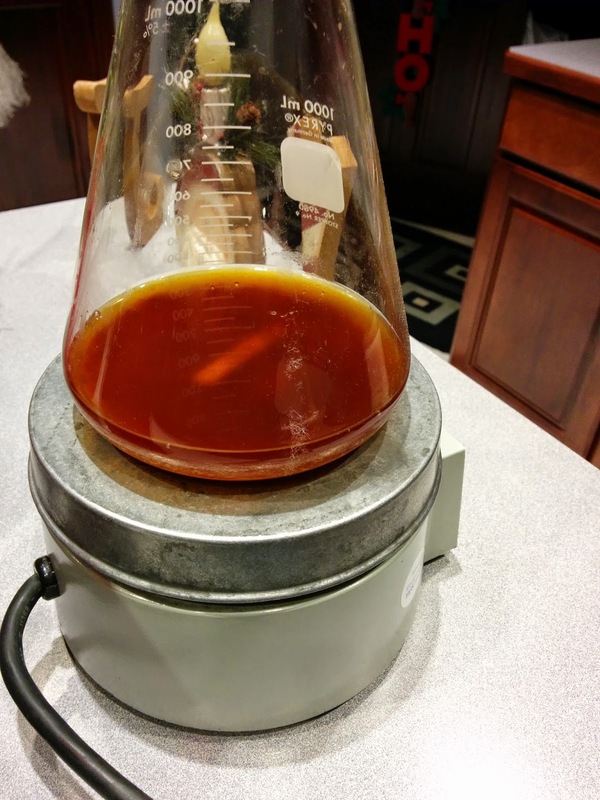 If your yeast isn't relatively fresh, or if you are brewing a high-gravity (high sugar content or high alcohol) beer style, then a yeast starter is usually a good idea. A yeast starter is basically a very weak wort. You'll brew up this wort, cool it to yeast-pitching temperature, then toss in your package of yeast. 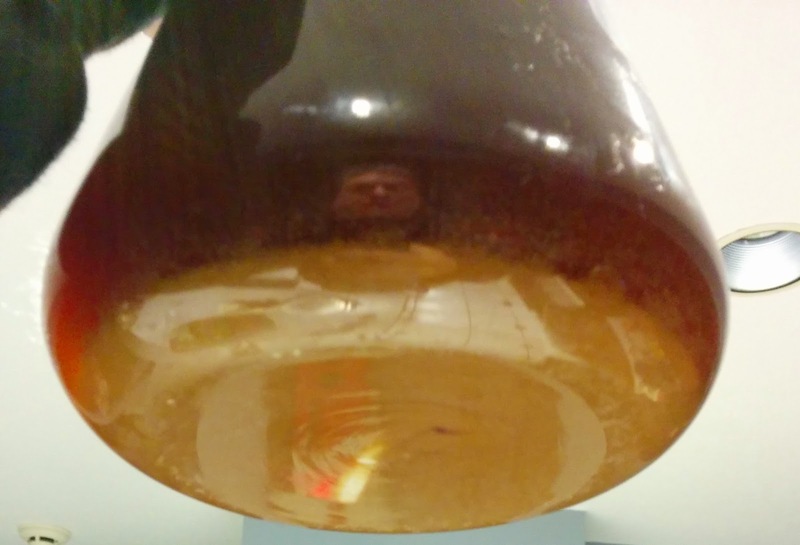 Inside this "starter wort" your yeast will activate and begin reproducing, increasing the number of cells available. 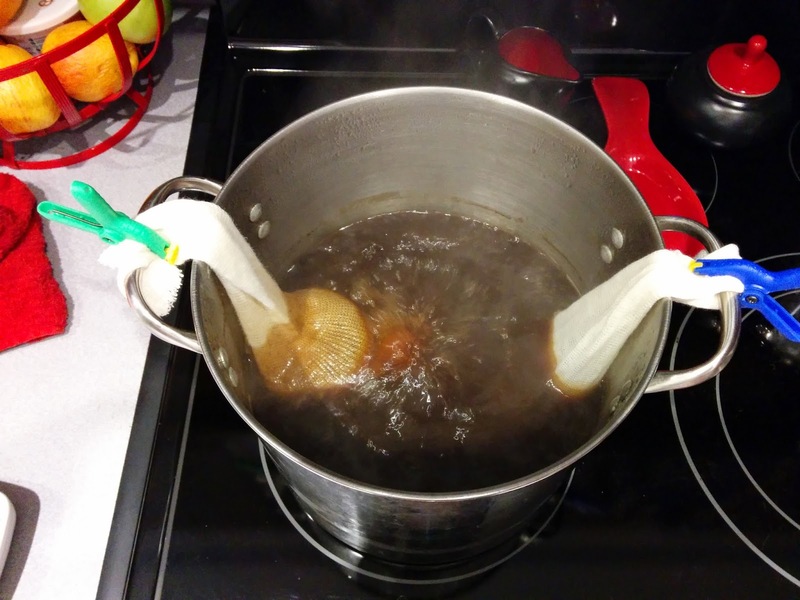 Depending on the age of your yeast packet and the beer you're brewing, you may need to use more than one yeast starter wort, or you may need to create two or three. 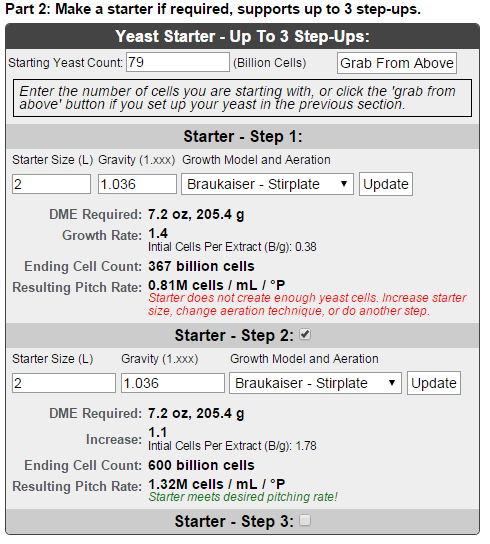 Each time you pitch the yeast into a new starter, the size of the yeast cell population will increase. How Do I Know If I Need a Yeast Starter? As mentioned earlier, for lower-gravity beers with a relatively fresh package of yeast, you may not need a starter at all. A typical package of yeast is meant to be enough to handle a 5-gallon batch of wort with a gravity in the 1.060 range. If your beer's starting gravity is at or below this, your batch size is at or below 5 gallons, and your yeast is relatively fresh, you probably don't need a starter. As you can see, my vial of yeast has only 79 billion estimated cells in it. 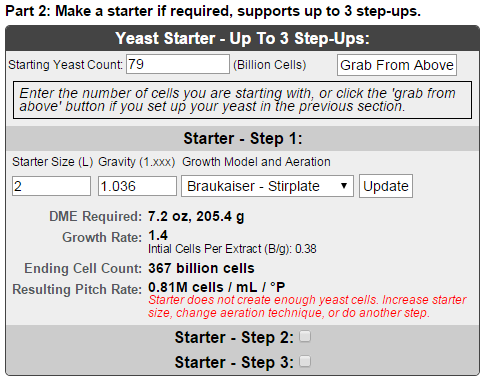 To pitch yeast at the right quantity for my particular beer batch, the calculator recommends that I have 568 billion cells. That's 489 billion more than I have. How Much of a Starter Will I Need? 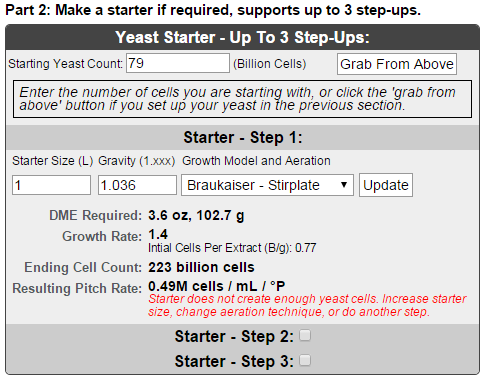 I'll click the "Grab from Above" button so that it pulls down my estimated starting yeast count of 79 billion cells. I have a 1 liter flask I'm planning to use for this starter, so I change the "2" under the starter size to a "1". 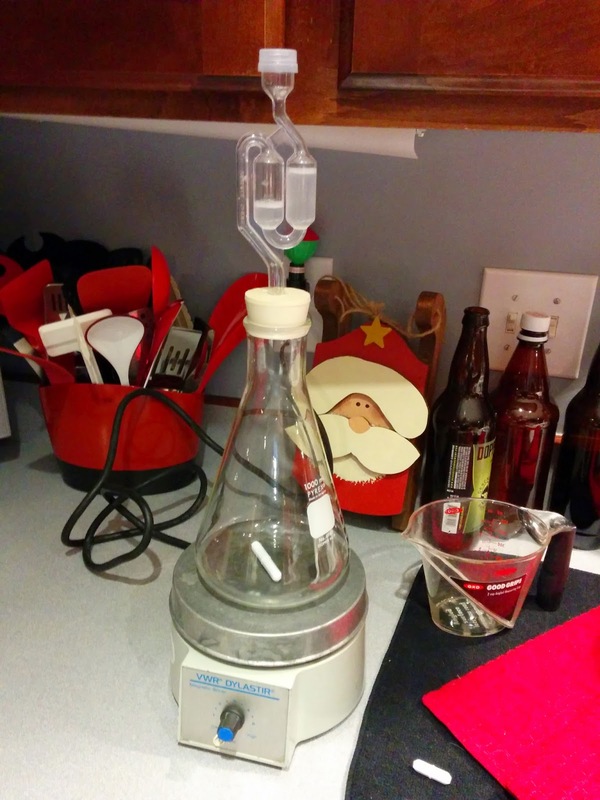 I also have a stirplate and magnetic stirrer, so I'll leave the "growth model and aeration" alone. Then I click "update" to see what my starter is going to yield. The calculator tells me that my 1 liter starter isn't going to be large enough. I guess I'll break out my 2 liter growler and recalculate. Wow... still not enough. I guess we'll need to have a second starter! 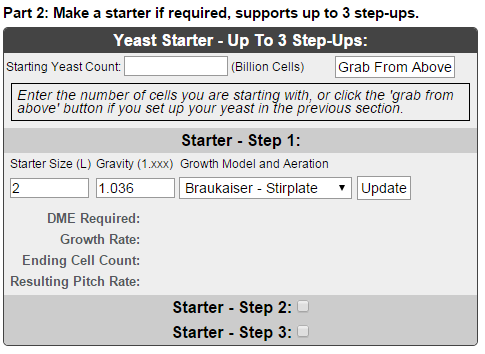 I check the "Starter - Step 2" box and set it for a 2-liter starter, then click Update. Now we're talking. After the second starter, we should have a population of about 600 billion cells, which is a bit more than the 568 billion we calculated as necessary for this particular beer. Time to get to work. A yeast starter is nothing more than a weak, low-gravity wort. You make it the same way you do the wort that you'll eventually pitch the finished yeast culture into. That is, you'll boil water, add malt extract, and a hops pellet or two. Then you'll aerate the wort and pitch the yeast into it. The big difference is that you will, if you have the equipment, drop in a magnetic stirring bar and set the starter on a magnetic stirring plate. This stirring action will aerate the wort, which will encourage the yeast to grow. 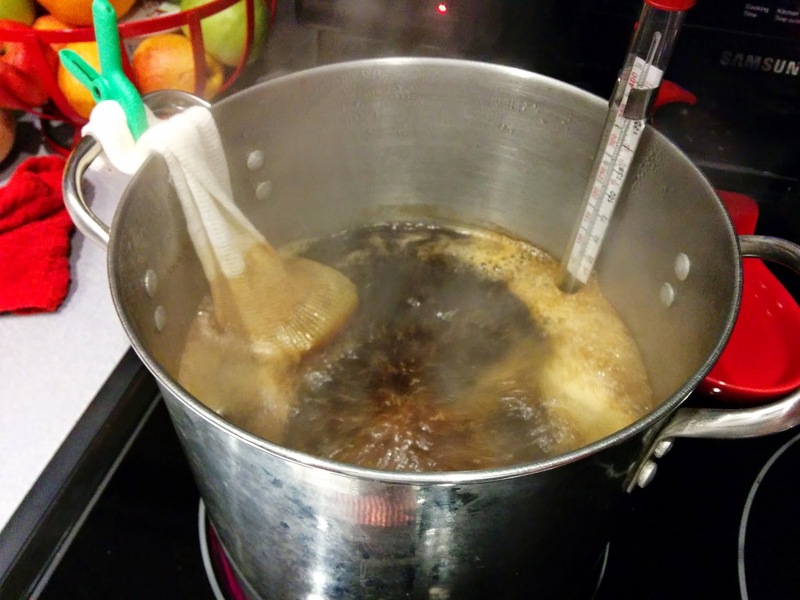 The goal in producing a starter wort is much like the goal of producing any wort. You want to hit a target gravity of approximately 1.036. A little higher (say 1.040) should be fine, but go much higher and you risk kicking the yeast into full-on active fermentation. The problem there is that when the yeast finishes with the starter culture it may go into hibernation - not where you want it when you pitch it into your finished beer. Mix these ingredients and boil them for 15-20 minutes to sterilize. Chill the starter wort to an appropriate temperature for your yeast strain, then pour it into a sanitized container with a sanitized funnel. Check the gravity of the starter wort before pitching yeast into it, to ensure that it's in the right range. If it's too high dilute it with some sterilized water. If it's too low, add a little DME and boil it again to sterilize. For the 2-liter starter we need in this example, I'll have to double the quantities. 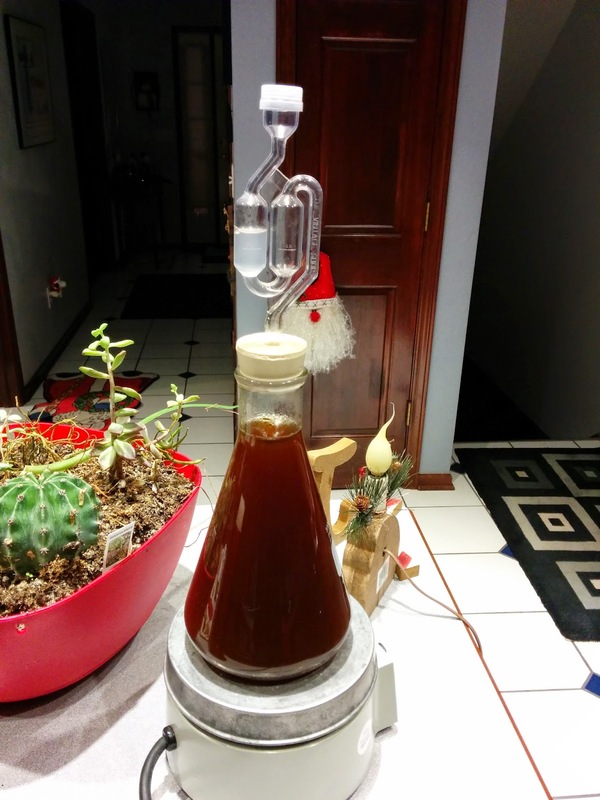 Below are some photos of a recent yeast starter I made. It's important to note something in these photos. Normally people don't use an airlock in their flasks when doing yeast starters. In this particular case, I wanted maximum growth out of my yeast, so I used my oxygenator to infuse the starter with lots of oxygen so that I wouldn't need to leave it open. As you'll see later on, this seems to have made the yeast very happy, since they ended up blowing wort into the airlock.